Pros: Greatly improves the application of makeup. Inexpensive. Non-latex/hypoallergenic. Cons: Hard to clean, especially if you don’t do it right after using it. Have to find a way to store it that keeps it clean and allows it to dry. (I’ve been using the container it comes in, turned upside-down as a sort of “stand” for the sponge.) Soaks up some of your foundation. In Summary: This is definitely a great alternative to disposable cosmetic wedges. I’ve used and washed this several times and it shows no signs of falling apart. The only real issue is cleaning and sanitizing it. For everyday cleaning, I’ve been using a foaming multi-purpose cleanser I got during my hospital stay last year. It’s worked better than the makeup remover/cleanser I was trying to use. (Not sure what I’m going to use when I run out of the hospital-supplied stuff…) Sanitizing is more of a concern for me. I have acne-prone skin, so I worry about bacteria being trapped in the sponge. To solve this, I’ve been using peroxide to get it extra clean. This is probably not good for the long-term survival of the sponge, but I want to make sure it’s really clean. Cleaning and sanitizing aside, I think this is an amazing product. 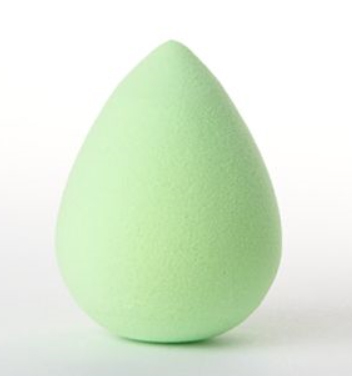 I’m not sure how much better the Beauty Blender one can be, but – for me – it’s not going to be “better” enough to spend almost five times as much on it. Shown in green. Also available in pink.